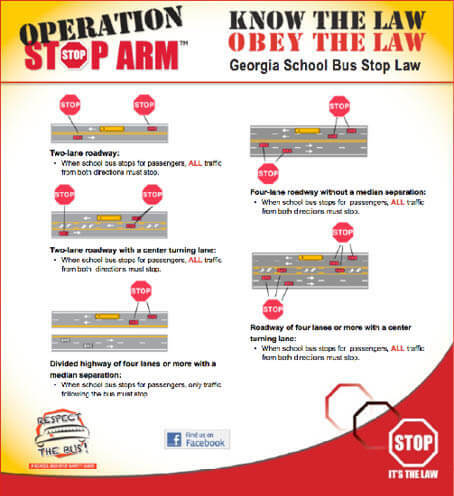 In most cases, all drivers are required to stop when approaching or meeting a stopped school bus that has its lights flashing and is loading or unloading passengers. The exception to this rule is when highways are separated in the center by median strips. In this situation, only vehicles following or traveling alongside a school bus in the same direction must stop. A warning will be given in advance by the flashing red or amber lights on the front and rear of the bus. After stopping, you must remain stopped until the bus resumes motion or deactivates its warning signals AND all loading or unloading passengers have cleared the roadway.